I ordered a cable at 3.28pm Thursday and it arrive in Macedon in central Victoria the next morning. Terrific service at a great price. It was not worth even getting the car out of the garage. I will be buying here in the future. 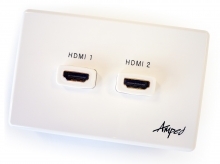 If HDMI represents the future in home audio and visual set-up, then the Amped Classic Double HDMI (White Wall Plate) is the way to go! With pretty much all new audio visual equipment made standard with HDMI technology, this wall plate allows you to conveniently take advantage of this popular technology. So why would you only get one when you can get twice the fun with two on th same plate! The Amped Classic Double HDMI (White Wall Plate) is perfect for streamlining your home theatre and hi-fi connection system and clearing away the clutter of cables. This premium wall plate is certified to the highest HDMI v1.3c standards (HDCP 1.2) and is perfect for a Full High-Definition Experience. The large 10.2 Gbps bandwidth and 24k gold plated corrosion resistant terminals guarantee smooth crystal-clear signal transfer for the ultimate HD experience! The Amped Classic Double HDMI White Wall Plate has been crafted specifically using a classic white finish and a smooth custom 11mm thick moulded design to complement any existing wall plates and décor you may have. Using only premium components the Amped Classic Double HDMI White Wall Plate is a favourite for a professional look and feel. Don't think of it as a quick fix, either; the 10 Year Guarantee ensures this wall plate will last and last through hundreds and thousands of movies and television shows.